Gary Peters is a Jamestown native, so he knows the town and he knows about Lucy. After graduating from Jamestown High School (class of ’88), Gary studied at the Art Institute of Fort Lauderdale, Florida, and the Rochester Institute of Technology in fine arts and illustration. Gary was the perfect artist for the job. The wall space for the mural was contributed by Duke Moving & Storage Inc. located at 33 Forest Ave in Brooklyn Square, overlooking the historic site of Jamestown’s original Farmer’s Market. The subject of murals may change, but the method of painting them is as old as the work of Michelangelo and daVinci, according to Peters. “You start with giant pieces of paper and you make a giant sketch. In this case it was 1,800 square feet. Then you poke holes along every line, hang it on the wall and spray black paint over the holes; it is an enormous stencil. Filling in between the lines with the right colors is harder. That’s where a lot of the artistry comes in,” Peters said. Art historians say mural painting may be the best preserved of all art forms. Excavated homes of ancient Pompeii still display bright, vibrant murals that are now 2000 years old, Egyptian tombs have revealed 3,200 year old murals, and in the caves of Southern France murals have been discovered that are at least 30,000 old. The Lucy Desi murals seen around Jamestown honor an ancient artistic tradition. Like music, murals can be appreciated by many at once and from both near and far. Murals are a uniting art form. The Lucille Ball, 33 cent postage stamp mural on the US Post Office was commissioned about the same time and was my first outdoor Lucy Mural. Third Street in Jamestown also boasts the ever popular Vitameatavegamin mural and others. Location and building structure also influence a viewer’s perspective and experience, Peters said. The modern definition of a mural includes the concept that “the architectural elements of the mural’s space are incorporated harmoniously into the picture.” Close inspection of the wall of Duke Moving & Storage reveals that a rather ornate picture frame, perfectly suited to an 1,800 square foot picture, was designed into the brickwork of the building itself. “My latest mural, ‘California, Here We Come,’ could have been done anywhere in the world, but the fact that it’s in Lucy’s home town gives it a special character it couldn’t have anywhere else,” Peters explained. The local connections, like Duke’s provision of the wall space and Sherwin Williams’ donation of a lot of the paint and the addition of secret messages, like the scene’s episode number (110) being hidden among picture details, all add more levels of meaning to the work. 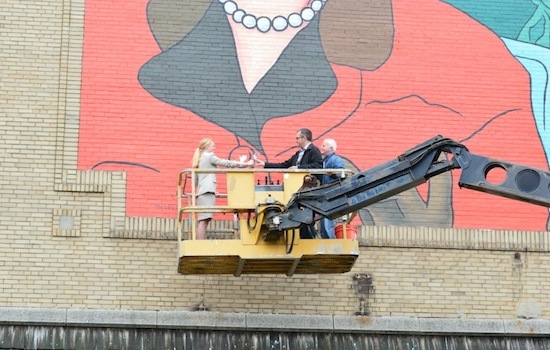 “I am a professional illustrator and a mural painter,” Peters said. “An illustrator is also a caricature artist who pulls out the details that make something unique. Norman Rockwell may have been the best known illustrator of that kind in the last two centuries. He was a superb artist too, though a debate remains whether our kind of work is fine art or creative draftsmanship. I believe it can be both,” Peters added. The Lucy/Desi Murals have been commissioned by the Lucy/Desi Museum in Downtown Jamestown as part of the museum’s ongoing plan to promote the Queen of Comedy herself, her legacy of giving a helping hand to innovative, fresh new comedians and to promote Jamestown, New York, as America’s Capital of Comedy. To learn more about Gary Peters and his work, and to access a downloadable copy of Peters’ Master of Fine Arts theses, “Making Moves – an adventure through space, colour and form,” log on to http://www.garypeters.info/ or find Gary on Facebook at GP Creative Services.